Roughly 300 million years ago, the Ancestral Rocky Mountains towered over what is now Colorado. At the western base of this ancient chain of granite peaks was an inland sea. Over time, the Ancestral Rocky Mountains completely eroded, leaving Colorado a flat place. Shallow seas alternately invaded and retreated in the tens of millions of years that followed. The current Rocky Mountains began to rise about 70 million years ago. This new mountain-building process pushed areas that were once on the ocean floor high above today’s sea level. One of those areas is the Minturn Formation of central Colorado. 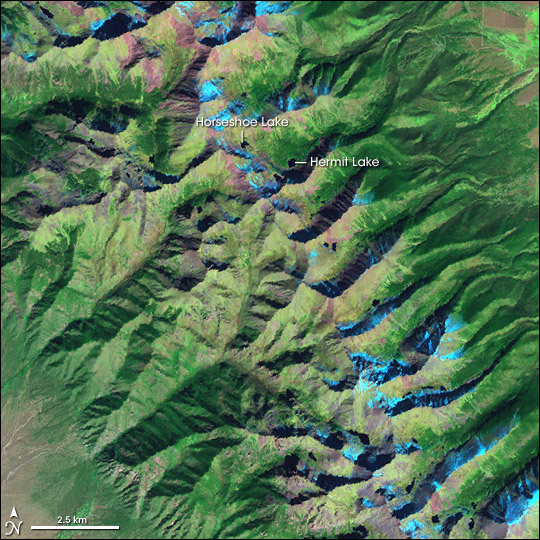 The Enhanced Thematic Mapper Plus (ETM+) instrument on NASA’s Landsat satellite captured this false-color image of part of the Minturn Formation on October 14, 1999. In this image, pink indicates bare ground, and green indicates vegetation. Snowy areas are light blue. 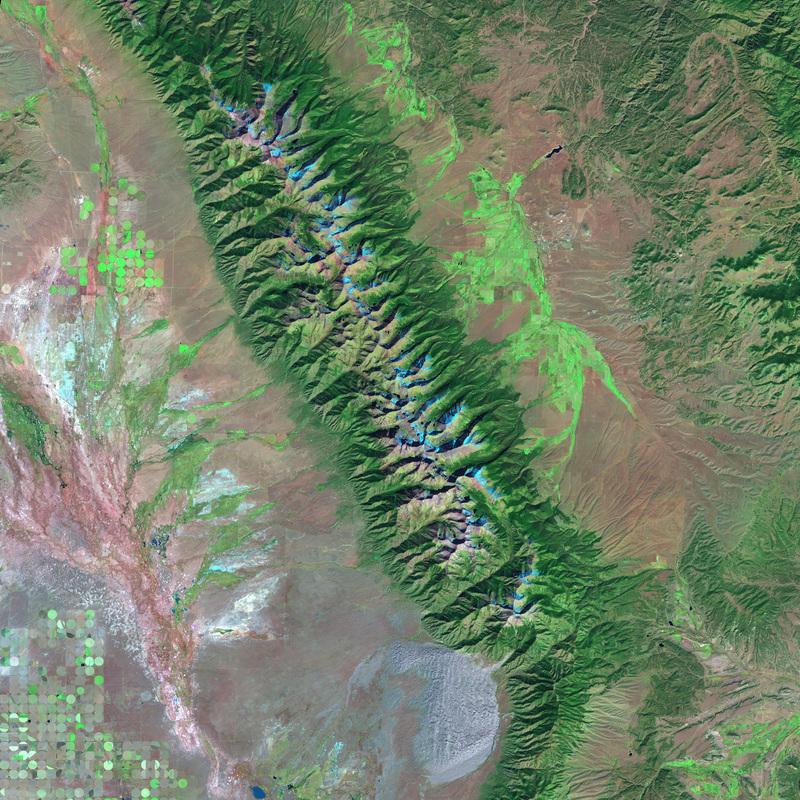 Pale rivulet patterns in the southwestern (lower left) corner of the image show where streams drain from the mountains to the adjacent lowlands. The large image shows brilliant green circles of center-pivot-irrigation fields and the pale pink crescent of the nearby Great Sand Dunes National Park. Geologic formations like the Minturn are formally named groups of rock outcrops, and a formation is generally assumed to have formed at a certain time under certain conditions. The Minturn Formation and neighboring rock formations run through the area shown in this image, near Hermit Lake and Horseshoe Lake. Many ancient rock formations are not easily identified from satellite images, and the Minturn is no exception. The formations are better identified by on-the-ground examinations of rock types and the fossils they contain. 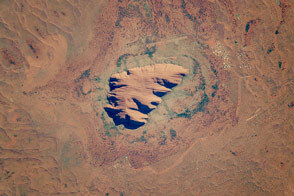 This image does, however, show the mountainous terrain that elevated ancient landscapes. Centuries ago, scholars puzzled over how seashells could wind up on the tops of mountains. Fossil seashells are now recognized as the remains of ancient sea floors raised to high altitudes by mountain building. Named for the nearby town of Minturn, the Minturn Formation preserves evidence of the ancient seaway, including fossil fish, mollusks, echinoderms (invertebrates related to modern starfish and sea urchins), brachiopods (invertebrates with a superficial resemblance to bivalves), and corals. NASA image created Jesse Allen, Earth Observatory, using data provided courtesy of the University of Maryland’s Global Land Cover Facility.